It sounds strange, but deleting your data doesn’t destroy it permanently. Data Shredder does. It overwrites files multiple times to make them irretrievable. Emptying your PC’s trash bin isn’t enough to securely erase the data in those files. Anyone with access to your hard drive can recover that data with ease. So next time you sell, lend or repair your PC, make sure you get rid of your data permanently. Anyone with access to your hard drive can recover the data in your deleted files – which could be family photos or even videos. 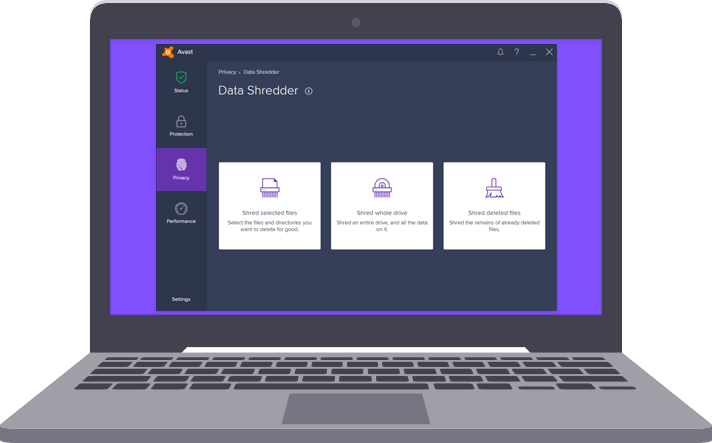 Data Shredder securely erases your deleted files by overwriting them with nonsense data. In other words, you can be sure your data has been fully destroyed. Avast Premier comes with Data Shredder installed, to give you peace of mind, especially before selling or repairing your PC. Got Avast Premier? Good - you’ve got Data Shredder too. To shred any file forever, just right-click it and select “Shred using Avast”. Looking to wipe the whole hard drive? Open your Avast and click on ‘Privacy’. The Data Shredder icon will give you all your shredding options.